GENICON concluded a productive exhibition at Arab Health Dubai with over 84,000 attendees from 160 different countries. This show is an optimal gateway to strengthen distributor relationships, present new products and updates , as well as acquire feedback for business opportunities for 2019. A huge thank you to everyone who visited us this year at MEDICA 2018 in Dusseldorf, Germany. We appreciate the opportunity to show our products to you as the perfect wrap up of 2018 and our vision for the year to come. On the four days of the fair, around 120,000 visitors (with an international share of approx. two thirds from around 155 countries) enjoyed an offer that was more extensive and international than ever before. The fair took place from 12 to 15 November 2018. We joined 5,272 exhibitors from 66 countries and an international share of more than 80 percent to help set a new record for MEDICA. 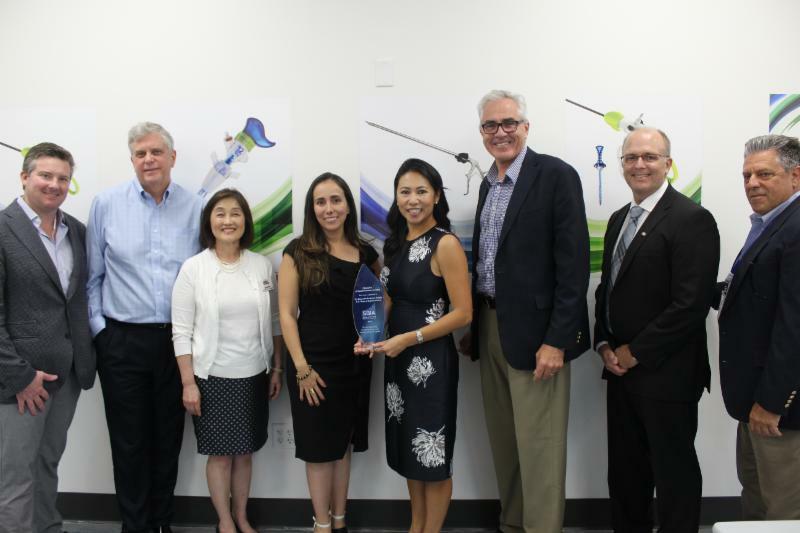 WASHINGTON, D.C. (October 24, 2018) – Today, the Small Business Investor Alliance (SBIA), the leading association of lower middle market private equity funds and investors, recognized Congresswoman Stephanie Murphy (D-FL) for her support of small business investment and presented her with SBIA’s Champion of Small Business Investing Award. Rep. Murphy is among a group of select Members of Congress whom SBIA is honoring in recognition of their support for small business access to capital. The award was presented to Rep. Murphy at GENICON–a manufacturer of surgical equipment in Winter Park, Florida–by SBIA members Dan Penberthy of Rand Capital and Chris Harris of Advantage Capital, along with GENICON executives and Board Members. “The support of Congresswoman Murphy improves not only the access to capital for small businesses in her region, but also helps to promote economic and job growth across the USA,” said Mr. Penberthy. SBICs provide critical growth capital to American small businesses to help them expand their operations and create jobs; they have invested more than $2.6 billion in Florida businesses over the past 10 years. Originally licensed in 2002, Rand Capital SBIC, Inc. has been a long-tenured partner of the Small Business Administration’s SBIC program. Rand Capital SBIC has invested over $65 million across more than 55 portfolio businesses with a focus on investing capital in underserved markets and supporting veteran and women-owned businesses. Rand’s ability to fund portfolio investments of $500,000-$2 million, for which there exists a large funding gap, fills a critical need for small businesses seeking growth capital. The Small Business Investor Alliance (SBIA) is the premier organization of lower middle market private equity funds and investors. SBIA works on behalf of its members as a tireless advocate for policies that promote competitive markets and robust domestic investment for growing small businesses. SBIA has been playing a pivotal role in promoting the growth and vitality of the private equity industry for over 50 years. For more information, visit www.SBIA.org or call 202-628-5055. For more information about our products feel free to contact us.